Pompeii and the Roman Villa: Art and Culture Around the Bay of Naples provides one with the sense of being transported to the area of Naples in the first century AD. The gateway to the exhibit is graced with a reproduction of a tile mosaic stating “cave canum” (beware of dog)—complete with a reproduction of a ferocious canine showing his teeth. The exhibit then moves forward to provide a glimpse of the lives of the people in this part of the world, rather than the images that we have become accustomed to seeing, which tend to focus on the infamous destruction that occurred at the hands of Vesuvius. This exhibit highlights the importance of Greek philosophy, art, and culture in harmony with all things Roman. As evidenced by the more than 150 objects displayed, the inhabitants around the Bay of Naples were fond of the arts and beauty. Even the working class who lived within the city of Pompeii had courtyards, sculpture, and frescoes in their homes, and the elite also had homes that reflected their passion for all things luxurious. While Naples was a Greek colony for several hundred years, it was under Roman rule that the infrastructure of the city of Pompeii was established. As part of the Roman Empire, the city of Pompeii grew beyond its merchant roots and into a playground for the rich and famous of the time. Yet the most important aspect of this lush and extensive exhibit is the awareness that women in the first century around the Bay of Naples were valued and valuable. In and of themselves, women were people of power and prestige. The female figure is presented as having a distinct and important place within the culture. This is evidenced by the number of ways that the feminine spirit is immortalized in this exhibit. Most notable is the depiction of Artemis, the Greek goddess of the hunt, who stands ready for whatever she may face. 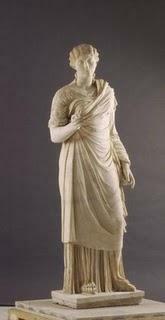 There is also an endearing depiction of the empress Livia and her son Tiberius, which is crafted to convey the power of a mother’s influence. Even more impressive than the art itself depicting the value of all things female as pure, strong, and essential is the fact that this exhibit represents the collaborative efforts of the National Gallery of Art, the Los Angeles County Museum of Art, the Direzione Regionale per i Beni Culturali e Paesaggistici della Campania, and the Soprintendenza Speciale per i Beni Archeologici di Napoli e Pompei. Pompeii and the Roman Villa: Art and Culture Around the Bay of Naples is a delight for the spirit and the senses.